In our previous post, we introduced the idea that a major underlying factor in discussion of the countywide plan (an umbrella term that includes the TMP and the proposal to incorporate a new transit authority: see this post for a discussion of the differences) is the concept of fairness. So much of the back-and-forth has been about the question of who will pay vs. who benefits, and how fair that is. Let’s review the proposition briefly. The idea is that the current Act 55 Ann Arbor city transit authority (AATA) will eventually be disbanded and its assets (both hard capital assets like buses and shelters, and financial reserves) will be turned over to a new Act 196 authority (currently being called the New Transit Authority) that has a broader potential geographic reach. See our post, AATA: Moving Us Along for some description of the process. But to give the new authority a solid revenue base, Ann Arbor’s perpetual millage (voted into the city charter by the citizens and thus sometimes called the “charter millage”) is proposed to be transferred to the new entity. The City of Ypsilanti, which also has a charter millage, would do the same. The NTA would also levy a millage across the entire county (or the parts that didn’t opt out of it) to support additional services. 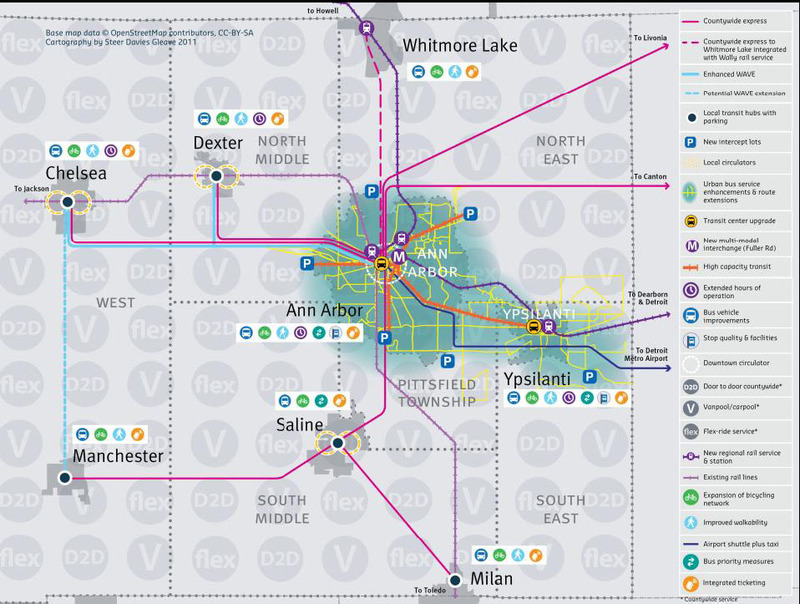 Depending on the level of that millage (both 1 mill and 1/2 mill have been discussed), it has been acknowledged that taxpayers of Ann Arbor will pay the greatest share, perhaps about 2/3, of the entire local tax collected to support the Transit Master Plan, which is also referred to as the “county-wide plan”. Is it fair if taxpayers in rural communities (the “countywide” in the table below) who will receive some, but not much, increased service, pay for an enhanced system with some strong urban biases? Is the proposed arrangement fair for the communities other than Ann Arbor who are part of the urban network? Is it fair if Ann Arbor taxpayers pay most of the cost of a county-wide system? As we discussed in a couple of former posts about politics of a millage vote and the likelihood that various local units might drop out of a “countywide” organization (5 townships out of 20 have already declined to participate), the history and politics of the other communities in Washtenaw County is that they are very resistant to voting for increased taxation, since even half a mill is a substantial fraction of their current taxes. The Transit Master Plan overview, as prepared by consultants Steer Davies Gleave. Click for larger view. Some communities are currently paying for AATA (fixed route bus) services, under what is called POSA (Purchase of Service Agreement). Those POSA would be revoked under the Act 196 NTA, since those communities would be part of the new transit regional authority. The City of Ypsilanti has a dedicated millage for transit of approximately 1 mill. Actually, that millage does not go directly to AATA as tax receipts. Instead, it is used to pay the POSA for the service that Ypsilanti has had in the past. (See the route map.) Originally, there was no money to pay for this service in Ypsilanti’s increasingly stressed city budget. For a while the cost was borne by Federal stimulus funds. Then, the citizens of Ypsilanti voted in the charter millage (a really brave and forward-looking act on their parts). Recently, because of changes in the AATA chargeback schedule, the millage amount fell short of the required amount to pay the POSA, causing consternation in Ypsilanti’s City Council. But the service has not been curtailed, and even better, recently service on Route 4 has been increased at no additional cost to Ypsilanti (the amount not covered by Federal formula funds is paid by Ann Arbor taxpayers). Still, the on-and-off-again bus funding has led Ypsilanti’s mayor Paul Schreiber to support the 4-party plan at a public hearing in Ann Arbor “to stabilize Ypsilanti’s bus service”. Now that the City of Ann Arbor has (provisionally) approved the 4-party agreement, the baton passes to the City of Ypsilanti. My information is that it (the agreement) is on the March 20 council agenda. To POSA or not to POSA? Ypsilanti City and three other Washtenaw County municipalities currently pay POSA (purchase of service agreement) contractual amounts to AATA for specified services. They are all within that urban network seen in the map above. POSA charges are calculated yearly using a formula to pay actual “loaded” costs of the specified services. In general, POSA amounts are part of a municipality’s general fund budget and are paid right off the top of their discretionary revenue. Here are the amounts these communities currently pay in POSA charges, and the total tax that would be raised if the countywide millage were applied instead. Note that the POSA charges would disappear. *Amounts for Ypsilanti City are calculated differently. Its tax rate would include the current 1 mill plus the additional countywide millage. As is quickly evident, the total tax dollars paid by each municipality would be considerably higher with the new transit plan. The difference for all but Ypsilanti City is that the municipal budgets would save money and the costs would be transferred to their taxpayers. Because Ypsilanti City would be a signatory to the 4-party plan, while the accounting method would change (a direct transfer of their millage to the NTA rather than a check), their taxpayers would continue to pay the current millage amount plus the additional millage. This might not seem too bad a deal for Ypsilanti City, considering that they are already receiving enhanced service without paying for it and there are many of the other enhancements to the urban network will serve them directly. But whether their anguished taxpayers will agree with this as they face two more impending tax measures is a different question. For the other municipalities, it does not appear that they will immediately see markedly different service levels. The current routes that are being supplied with fixed-route buses may see some hour and frequency enhancements, and more Park and Ride lots and transit hubs might be built. But new fixed route lines look to be unlikely in the near future, based on the maps that have been provided. Thus, whether taxpayers from Superior, Ypsilanti and Pittsfield townships view the change as “fair” probably depends in part on whether they view the general increase in connectivity over the county to be beneficial to the overall economic climate and thus to themselves. All the discussion so far as been based on the assumption that the voters of the county will vote in a new millage to support a new transit authority. The talk for the last several years was that it would be 1 mill. However, this has now been scaled back to 0.5 mill.The recommendations of the Financial Task Force, issued on February 29, are just that, recommendations. The FTF has no actual authority and is not the final planning body for the new authority, which does not yet exist. Thus, its projections are merely hypothetical. Nevertheless, they were able to arrive at the 0.5 mill amount (which they style as a mere placeholder, not an actual recommendation for a millage) by stating that the capital-intensive commuter rail and connector programs should not be folded in to the 5-year plan (thus allowing a smaller budget gap to be addressed by a millage). Capital intensive portions of the original program were removed with the caveat that alternate sources of funding should be secured to support the service.However, the planning and development of the capital projects will continue, but will not be slated to utilize the new local funding source. Now this is a puzzling statement. Money is fungible and if an activity costs something, it comes out of the total budget. So if the FTF considered the total budget and recommended the exclusion of activities that are being carried out anyway, the money has to come from somewhere. AATA has, of course, had budgets for many years in which certain funds (like Federal formula funds) had to be allocated to specific services. But it is dizzying to consider an accounting system that somehow segregates general tax funds in such a ways that one dollar goes to allowable uses and another is held back. The sleight of hand is less impressive when the quarter falls out of the cuff. Another factor in the calculation of benefit vs. additional payment is that the FTF also recommended (in order to make this package fit into its tighter garment) that fares be raised an average 50 cents. So while the former POSA communities are paying more in property taxes, their transit riders will also be paying more to ride. Next: the conclusion. Is this plan fair to Ann Arbor? UPDATE: The final version of the 4-party agreement as passed by Council on March 5 is here. SECOND UPDATE: Note the comment regarding the meaning of the 4-party agreement below. There is additional justification for my statement that the 4-party agreement is necessary only because of the transfer of the two city millages. THIRD UPDATE: A commenter also raised the issue of availability of demand (“paratransit”) services. Though the Financial Task Force recommendations themselves make no reference to lowered expectations for these services (apart from a fare increase), the report from the subcommittee signaled that they may be regarded as optional, depending on funding. The quote is from their presentation on February 29, 2012. This entry was posted on March 10, 2012 at 9:35 pm and is filed under civic finance, politics, Transportation. You can subscribe via RSS 2.0 feed to this post's comments. You can comment below, or link to this permanent URL from your own site. How fair will this plan be for the existing transit riders? In addition to the increased fare proposal, the city inserted “vague” language to ensure no loss of existing service levels. Since the existing service levels are based on an annual budget deficit somewhere around $1 million per year, how can anyone make such a guarantee with a straight face?. You correctly identified how the townships will help finance this budgetary gap “for existing services” as well as those other capital projects. 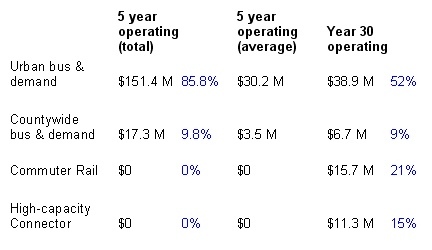 Any idea when AATA’s 2011 audited financials will be released? Yes, the AATA Board agenda for March 15 (6:30 at the AADL) has a presentation on the 2011 audit listed. I assume that the full audit will be available after that. I’m also concerned about existing service. The amendment that calls for no loss of service could serve as a cap rather than a floor. The creation of the “196” organization strikes me as not much – perhaps not at all – about serving current county residents, as to serve (1) people who live in Wayne or Livingston counties, and (2) the hundred thousand or so people that the local power elite seem to believe are moving to Washtenaw County in the near future. That is, this is, at best, an infrastructure for growth, not an infrastructure to serve the current population better. Based on the bate-and-switch history of local political politicos, promises of “better service” will likely prove to be mostly hollow. To me, the “fairness” issue turns on whether or not people want to build an infrastructure for a vastly more urbanized Washtenaw County, and to support commuters from other counties. Hi Vivienne. Thanks for continuing to cover countywide transit. There are two important points I’d like to clarify. First, the purpose of the 4-Party agreement. Yes, establishing an understanding regarding the charter millages is a key provision of the 4-Party agreement, however the 4-Party agreement also establishes a process for how to proceed, the requirements that must be met for a new authority to become operational, and defining the administrative role of the county. Second, proposed services for “ ‘countywide’ rural communities.” Express buses are a part of the plan for the non-urban areas, but more important are the Door to Door and Flex services that would cover the in-authority area. They are not cut out just because express services would be running. I know that proponents of the transition have repeatedly said that the 4-party agreement is a “framework” or process. But on rereading it, I am once again confirmed in my opinion that it would not be necessary at all if the intent were not to transfer AATA’s assets and the city’s millage to a new authority. Other than some paragraphs that merely summarize the situation, all the clauses and contingencies apply to the timing and conditions for the succession. The document is a very tightly written contract between the 4 parties that is aimed at this one outcome. If we were to begin from the beginning to create an Act 196 authority (for the entire county), the 4-party agreement would not be necessary or even indicated. The Board of Commissioners would pass the Articles of Incorporation, the new authority would hold a referendum, and if passed would levy a tax and begin offering services. It is the transition from a successful and fully funded city authority that is requiring all this effort. Several people have commented (not on this blog) that a combined Act 55/Act 196 transit organization could have done this job much more smoothly. The “donut hole” model described by Jerry Lax two years ago, where the Ann Arbor service would continue to be supported by the city millage, and the countywide service by the countywide millage, would have done this. Instead, AATA selected the “layer cake” method whereby the city millage can be used for the entire county. Note: I have now linked to the final version as passed by the Ann Arbor City Council on March 5, 2012. Please see the link under “UPDATE” at the end of the post. On your second point: yes, the FLEX and Door to Door (sometimes abbreviated D2D) services MAY be offered even though there are Express buses. But they are not required to be offered, as Federal regulations dictate for fixed-route buses.